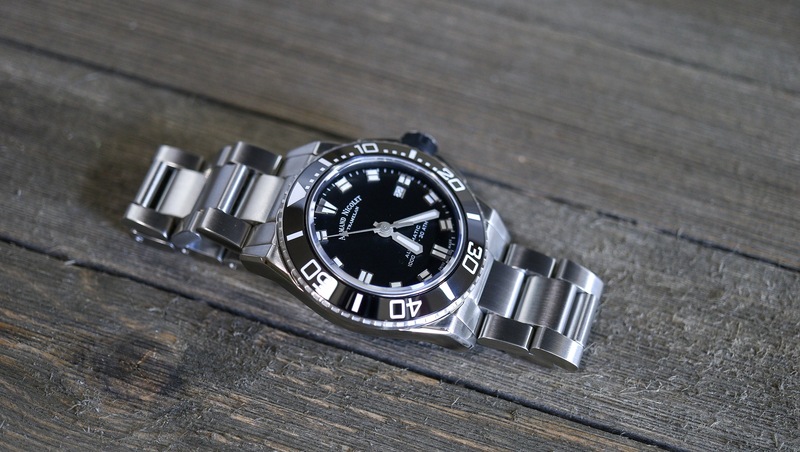 Every once in a while, I get a watch in for review that really stands out in terms of build quality and finishes. 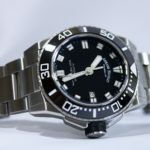 This time, that watch is the Armand Nicolet JS9. 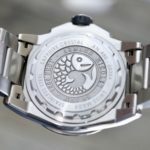 While it is not without a few quirks, the quality of this watch matches up with the price tag, which happens to be around $1700 USD. 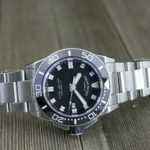 There is no doubt that in that price range there is some heavy competition, but the JS9 can hold its own in my opinion. 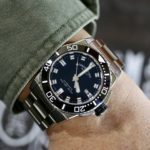 There is only one real problem, and that is I do not consider it to be a “true” dive watch, and that is what we will talk about here in this review, as well as some of its finer attributes. 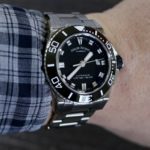 The Armand Nicolet JS9 is one of the latest releases from the Swiss company and I love almost everything about it. The construction is just solid. 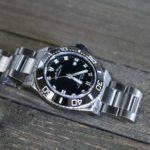 The bracelet and end links are a dream to take on and off for strap changes, the crown and bezel are easy to operate with a good sturdy feel and it features an engraved case back that is highly detailed and fun to look at and photograph. 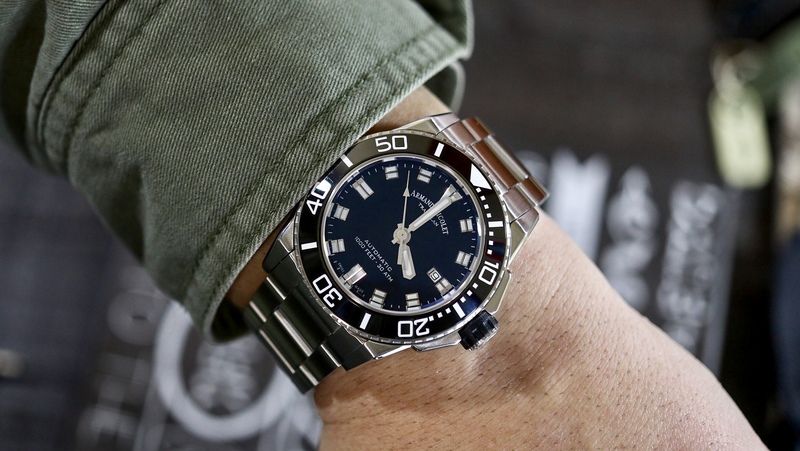 Running a Calibre AN2846-9 (base ETA 2846) with a 48-hour power reserve, it has a respectable movement and is marked at 300 Meters Water Resistant. 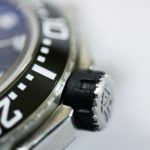 Unfortuanlty, for the dive watch aficionados, this is not a true dive watch. 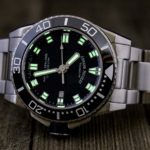 That is because the Armand Nicolet JS9 lacks a few features that keep it from getting that designation-No dive lock clasp, no lume on the 60 min triangle and no fully indexed bezel. 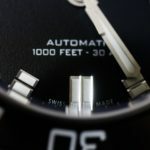 That last one is debatable, but to be ISO compliant nowadays, a fully indexed bezel has to be included. 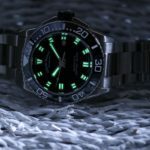 Forgetting that though, the fact they did a dual deployant and no lume pip in the ceramic bezel insert made me really scratch my head. 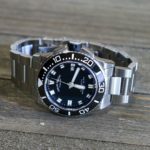 Here is this great looking watch with a nice ratcheting bezel and a solid screw down crown and a high water resistance on top of it, and they leave out some of the most important features to go diving in the ocean with it. 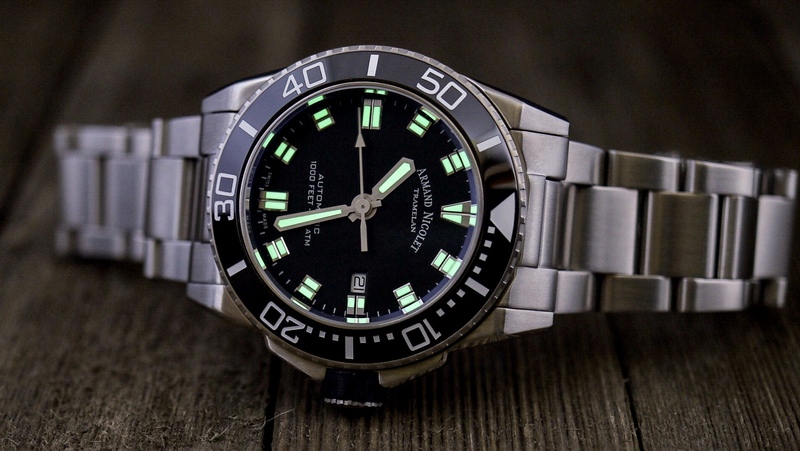 Maybe AN just figured most people who are buying these do not actually dive with it, but even still, would it have really killed the budget if you put on a good dive clasp and added lume to the bezel pip? Obviously, I found a few faults with the Armand Nicolet JS9 in that regard, but let’s turn the table and look at the good. 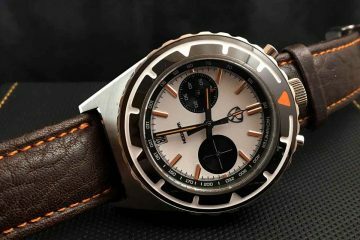 It is a great looking watch, at least to me. 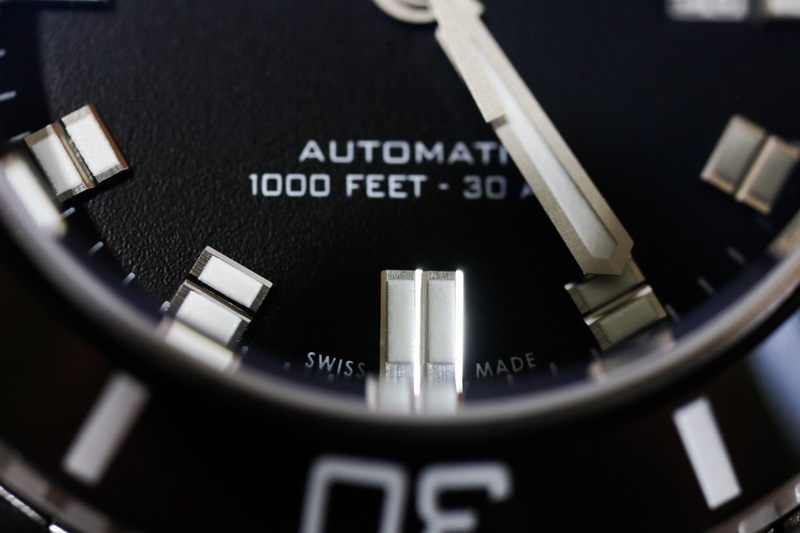 The dial texture is a nice change, the hands are not only aesthetically pleasing but large and easy to see and have a nice satin brushing that makes them pop against the dial. I really love the rectangle applied markers as well and how they alternated the orientation of them at 12,3,6 and 9. 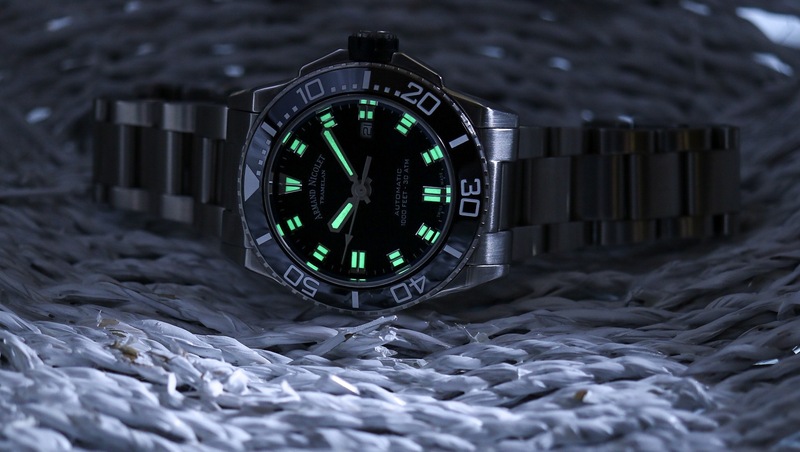 As you can see in the photo above, the lume is very bright and evenly coated as well. 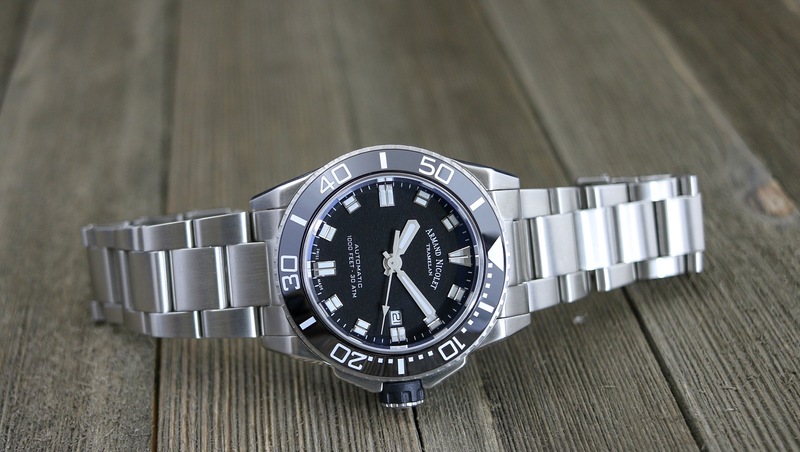 It has all that I want in a dive watch dial; clean, bright, good contrast and easy readability. 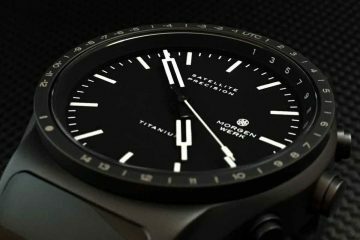 The think profile is something else we do not always get with a 300 Meter dive style watch, yet the Armand Nicolet JS9 has that as well. 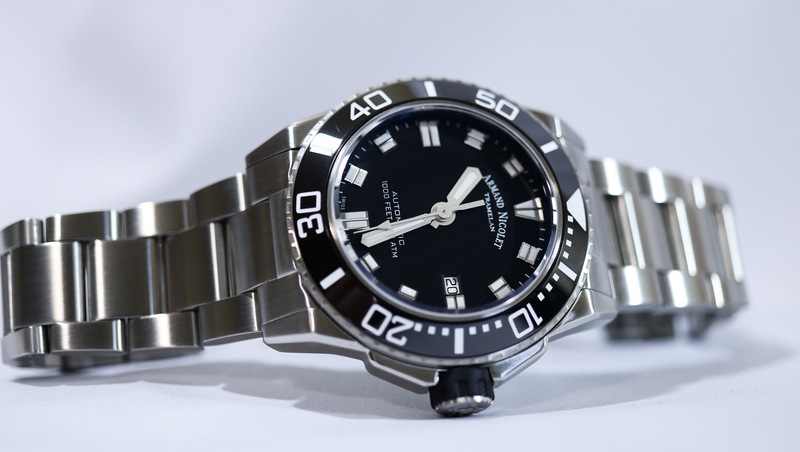 At 13mm thick (which includes the slightly domed sapphire crystal), this is not your typical big, bulky dive watch. 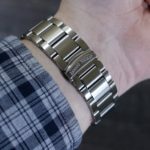 This allows it to sit nicely on the wrist and with that nice solid bracelet, it really does wrap around. I did have one issue with the bracelet though. 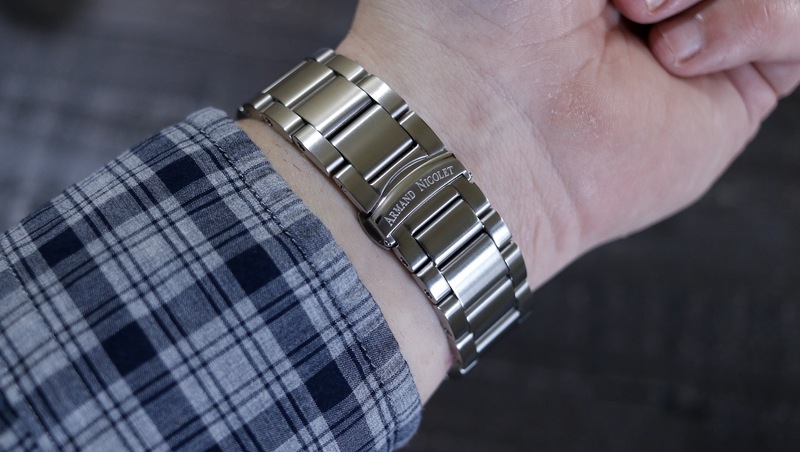 The screw bar system that holds the links in place is perfect, but the bracelet out of the box only included one-half link. 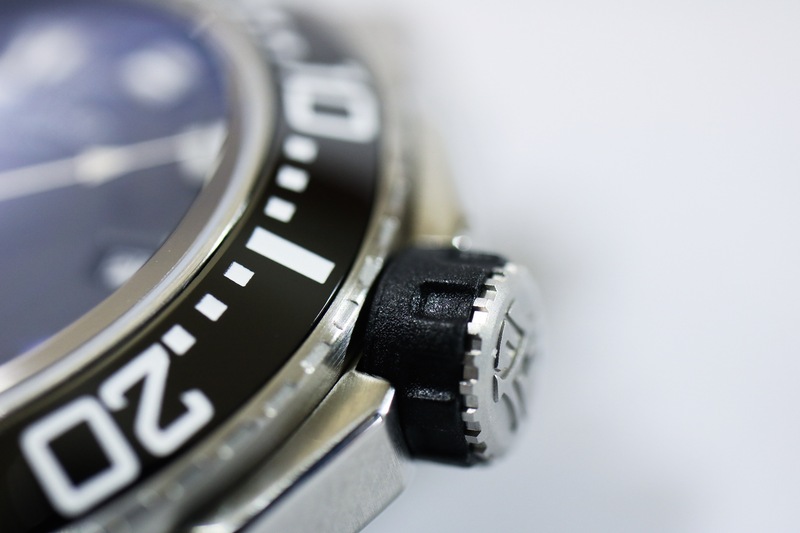 Anytime I have a watch with a dual deployant clasp, I need two half links, one on each side of the clasp. This allows me to get a perfect fit. After trying it out for a few days with one link removed and half link in, it was too tight on my wrist. I emailed AN and asked them to send me another half link. I took out one full link and added the half, and now I had a perfect fit. I just wish the bracelet came stock like this. 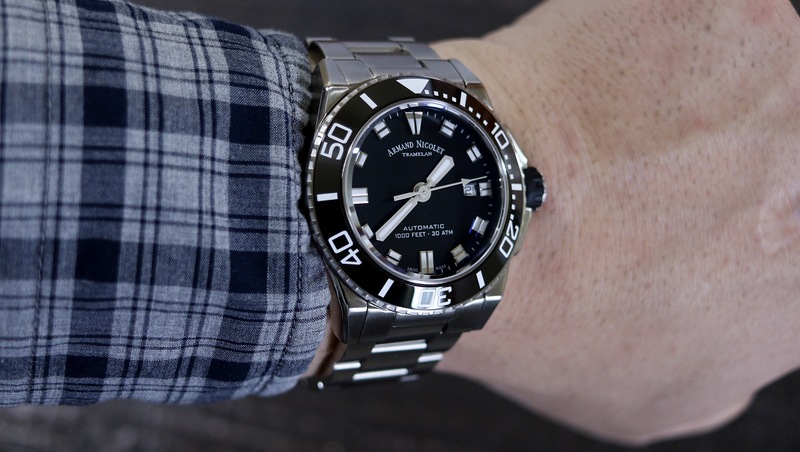 There is A LOT to like about the Armand Nicolet JS9, and even some things I love. 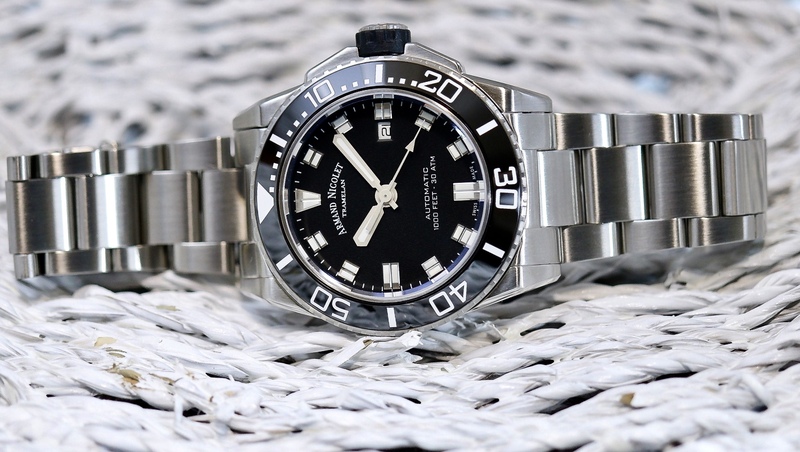 The biggest issue is that if you are looking for a serious dive watch, this is not it. If that does not matter to you and you are only going to be hopping in the pool or lake with it, then it should be fine. I feel they were going more for looks and style, and they gave us that in spades, and realistically there is nothing wrong with that. 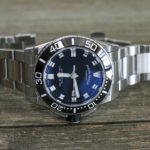 This watch is by no means in the budget category, but the quality and build are where it should be for the price, if not above. Nothing on the JS9 feels cheap or sub-par. It also comes in a few good other color options and there are rubber strap versions as well as full DLC variations to boot. 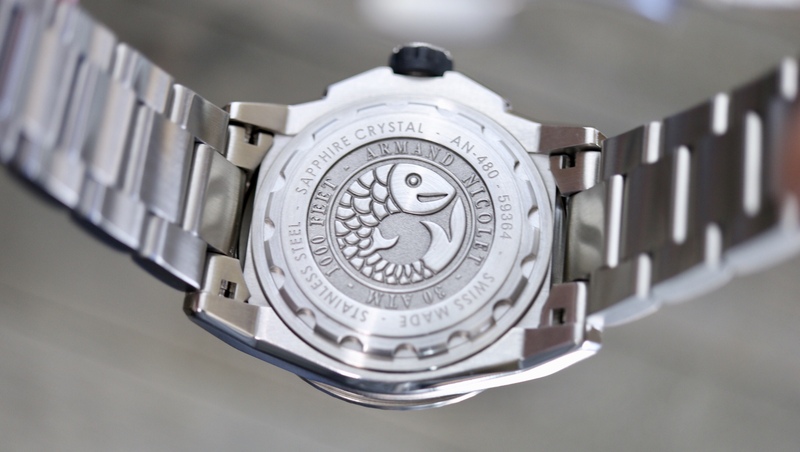 Armand Nicolet is a still a privately run company and a small one as well, with about 20 employees. 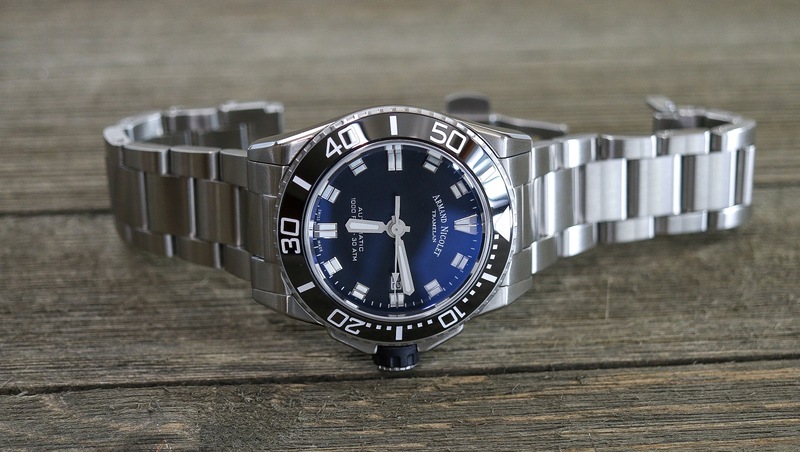 This is the second watch I have reviewed from them, and they make a good, solid watch. 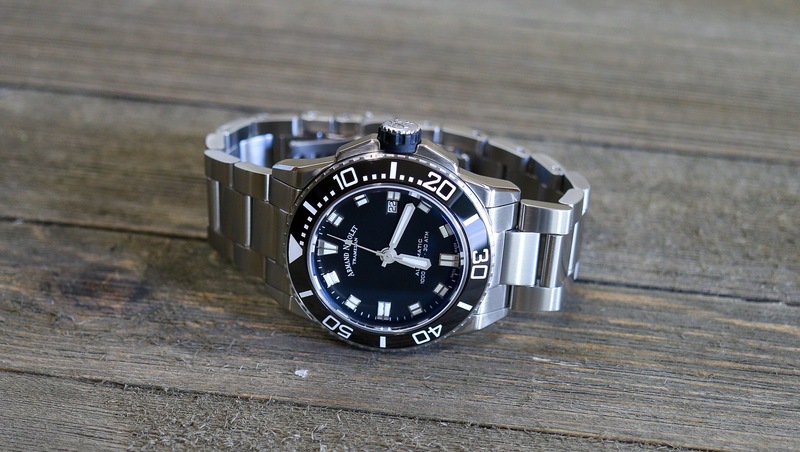 Maybe not a true dive watch, but a stylish well-built diver style watch nonetheless. 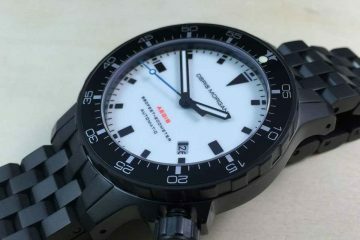 Don, I just received the same watch with the silver face. I tried removing links. The screws on the links turn but they do not seem to unthread. Do you know how to remove them? My apologies for replying to your comment late. I had no issues with removing the links. Are you using two screwdrivers as they are double sided screws? Even though you need to use to drivers, I found it very easy to remove on the example I had. 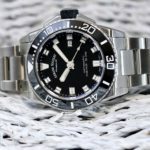 If you continue to have trouble, take it to a watchmaker or jeweler is all I can suggest.